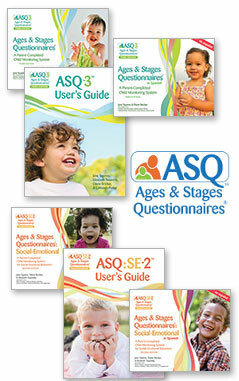 The Ages and Stages Questionnaires are parent-completed development and social-emotional screeners for young children. Easy, reliable, and cost-effective, these screeners help determine if there are delays in key areas of a child's development. 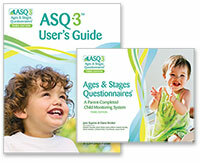 THe ASQ-3 is a developmental screener that evaluates communication, gross motor, fine motor, problem solving, and personal-social development. It can be used for infants up to children at age 5. 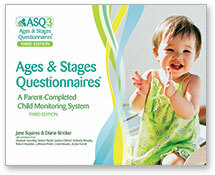 The Ages and Stages Questionnaire takes 10–15 minutes to complete and 2–3 minutes to score, and has 30 items per questionnaire with 10 questions. 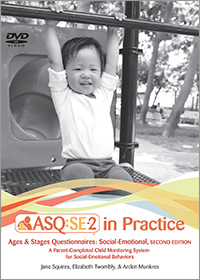 The ASQ:SE-2 is a social-emotional screener that evaluates 7 key areas including self-regulation, compliance, communication, adaptive functioning, autonomy, affect, and interaction with people. 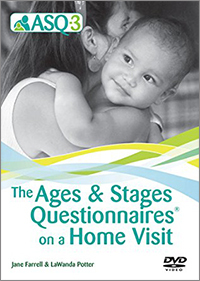 Periodically screen children ages 1–72 months to monitor progress and detect if there are social-emotional delays in development using the Ages and Stages Questionnaires. Click the cover to order. The ASQ-3 has been a trusted tool for more than 15 years to pinpoint delays as early as possible during the crucial first 5 years of life. The starter kit gives you everything you need to effectively screen five key developmental areas: communication, gross motor, fine motor, problem solving, and personal-social. The ASQ-3 has been a trusted tool for more than 15 years to pinpoint delays as early as possible during the crucial first 5 years of life. The Spanish version of the starter kit gives you everything you need to effectively screen five key developmental areas: communication, gross motor, fine motor, problem solving, and personal-social. 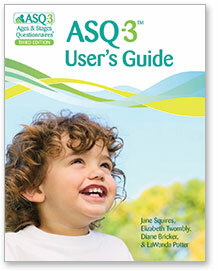 The essential companion to the #1 developmental screener, the updated ASQ-3 User’s Guide gives you all the information and guidance needed to use ASQ-3. Uncover possible social-emotional issues during the crucial first 6 tears of life with the new edition of the bestselling screener. 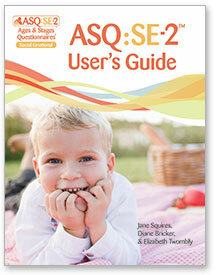 ASQ:SE-2 questionnaires effectively screen seven key developmental areas: self-regulation, compliance, adaptive functioning, autonomy, affect, social-communication, and interaction with people. Uncover possible social-emotional issues the crucial first 6 tears of life with the new edition of the bestselling screener. 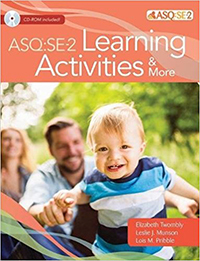 ASQ:SE-2 questionnaires effectively screen seven key developmental areas: self-regulation, compliance, adaptive functioning, autonomy, affect, social-communication, and interaction with people. 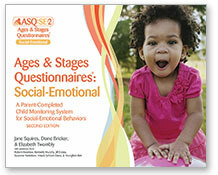 This clear, comprehensive guide helps professionals ensure they’re making the most of the highly reliable, accurate, and parent-friendly screener, ASQ-SE—so they can catch social-emotional issues early and help improve child outcomes. The user’s guide gives you all the information you need to use the screener accurately and effectively. 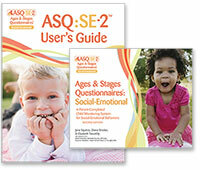 The ASQ:SE-2 questionnaires are the most cost-effective, reliable way to screen young children for social-emotional issues in the first 6 years of life. The new second edition brings you nine improved age-appropriate questionnaires to effectively screen seven key social-emotional areas: self-regulation, compliance, adaptive functioning, autonomy, affect, social-communication, and interaction with people. 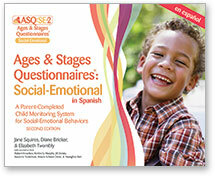 The ASQ:SE-2 questionnaires in Spanish are the most cost-effective, reliable way to screen young children for social-emotional issues in the first 6 years of life. The new second edition brings you nine improved age-appropriate questionnaires to effectively screen seven key social-emotional areas: self-regulation, compliance, adaptive functioning, autonomy, affect, social-communication, and interaction with people. 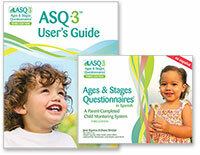 ASQ on a Home Visit demonstrates completion of the ASQ questionnaires for two children. Their family is introduced and guided through questionnaire completion by a home visitor. Enhance the social-emotional development of infants and young children with this treasure trove of learning activities, handouts, and more! 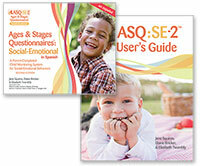 Specially developed to complement ASQ:SE-2, this essential resource makes it a snap to share practical social-emotional strategies with parents of children from birth to age 6.